In the village of Awasari, in the District of Pun India Mr. Shivaji Gajananath Shinde and his wife Resham Shinde are dedicated farmers. They’ve converted their rocky soil into a viable farming land. The land, obtained by their great grandfather, was changed by the couple when the two decided to use NPK tests and a mixed FYM to revitalize the soil. After they’d been advised by agricultural experts and renewed the land the farmers used a row system to transplant over 3800 marigold seedlings. The dedication of the Shindes was apparent in their regular care. They watered the plants every three days and were able to harvest 50kg of marigold flowers only 45 days after transplanting. They were able to sell their harvest at Mumbai Market for Rs. 70 ($ 1.03)* per kilogram. The farmers earned 1.75 Lakh** rupees ($ 2570) on their 2.5 ton yield with their expenses on fertilizer, drip irrigation and labour amounting to 55,000 rupees ($ 807 USD). New Mumbai, Kalyan and Pune are major markets for Marigold flowers as the beautiful blossoms are used in celebrations, festivals, and weddings. The demand for Marigold is increasing day by day. 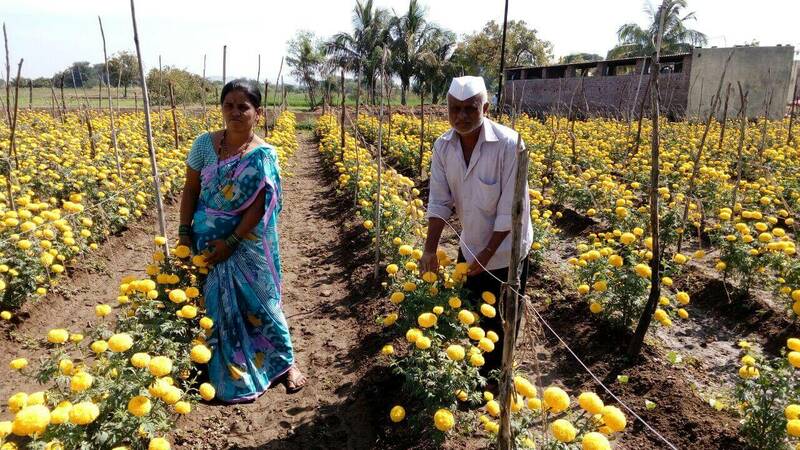 This is a boon to farmers as the flower is very easy to harvest making Marigolds a cash crop.